Transcript of interview with Ariel Sigler. See video. Bueno, el régimen cubano sabe cuál es la situación grave que presenta en este momento con respecto al avance que ha tenido la oposición en Cuba, y arrastrar ese pueblo cubano que durante tanto tiempo necesitaba una guía, con el objetivo de obtener su libertad y bueno esa guía ya está llegando. Transcript of interview with Guido Sigler, former political prisoner. See video. Si mira la situación en Cuba con respecto al gobierno esta tensa, bastante tensa, el gobierno tiene mucho miedo, por qué, porque hay una Cuba y un pueblo que ha despertado y ha dicho basta que ya no es solo la oposición. Si no es el pueblo de Cuba que ya no quiere una dictadura permanente un pueblo allí, un pueblo que llora por dentro, un pueblo que sufre, un pueblo se le ha quitado su libertad y eso la está buscando al precio que sea necesaria. 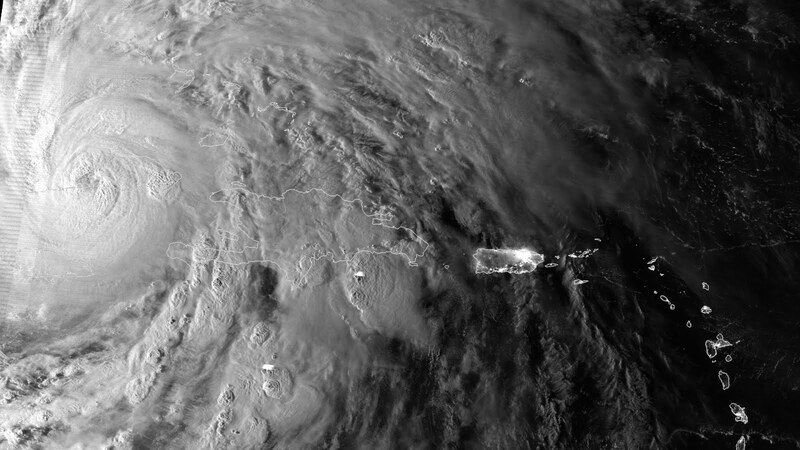 This is an infrared satellite photo of Hurricane Sandy as it made landfall over Cuba, center left, early on the morning of Oct. 25. Also visible are the city lights of Puerto Rico and the Virgin Islands. U.S. diplomats in Havana evidently have an "eIntern," who was scheduled to do a project related to independent libraries in Cuba. The eIntern was expected to work for nine months during the 2012-2013 academic year. The job is unpaid, but would be a great opportunity for anyone interested in learning more about the Foreign Service. Develop book club discussion questions and activities for classic American literature for adults, youth and children for use (in) Cuba's independent libraries, and research quality Spanish language resource websites to link to USINT's home page. See more about the State Department's Virtual Student Foreign Service (VSFS) eInternship program here. 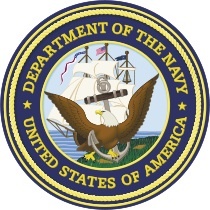 POSITION INFORMATION: . - VSFS eInterns serve for a period of up to nine months. Potential opportunities to continue longer. I went through a stack of confidential State Department documents looking for items related to Cuba. I found more on Venezuela than Cuba. I didn't see anything here that's really earth-shattering, but thought I'd share the documents in case any readers are interested in them. 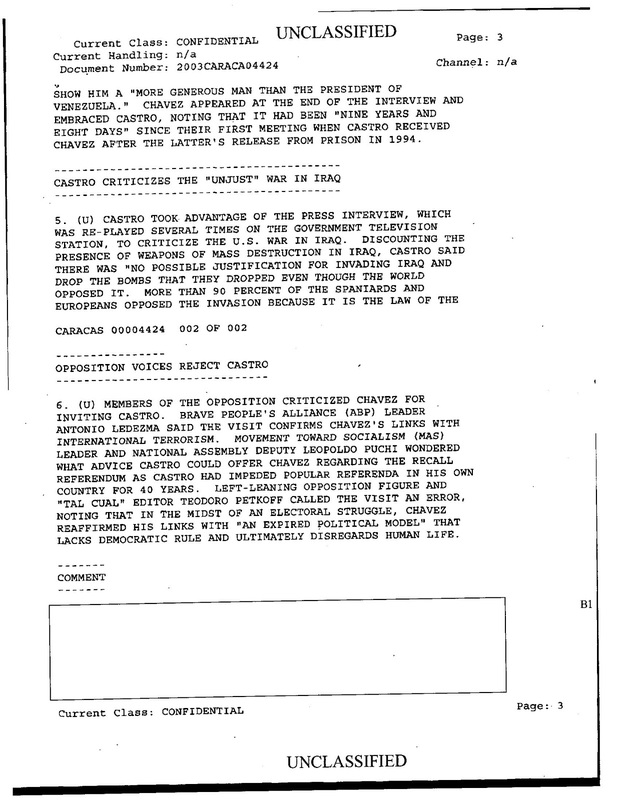 They are marked "unclassified" and are redacted. Download all documents as a single PDF (141 pages, 3.7 MB). Pulitzer Center grantees submitted photos to celebrate the National Day of Writing. My photo is in there somewhere. See the Pulitzer Center Facebook album here. Gutiérrez Menoyo: "They've tried to erase me from history"
Condolences to the family of Eloy Gutiérrez Menoyo. The former rebel fighter died this morning at a hospital in Havana. Below is a story I wrote about Menoyo for the Dallas Morning News in August 2003. Alone and nearly blind in one eye, a 68-year-old Cuban exile wants to bring democracy to the Western Hemisphere's last Marxist outpost. Eloy Gutiérrez Menoyo has already spent nearly 22 years in prison for opposing Fidel Castro. Undeterred, he's trying to organize a new opposition group in Cuba, risking deportation or another jail sentence. "I could be kicked out of Cuba at any time for what I'm doing. I recognize that," he said. "Opposition groups are illegal in Cuba." Commander Carlos A. Iglesias of the U.S. Navy outlines steps for ending "the insanity" of the U.S. government's "static, tried-and-failed isolation policies" toward Cuba. 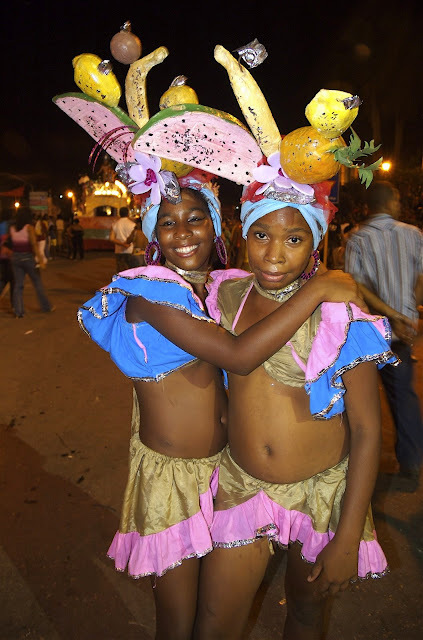 U.S. policy towards Cuba has long lost its creative initiative and effectiveness. As much a tribute to the political cunning of Fidel Castro as to other domestic forces, American efforts at regime removal and support to the Cuban people have all ended counterproductively. With each action, the Revolutionary government has emerged even more politically powerful and entrenched. However, recent changes on the island have for the first time opened up unique opportunities and windows to advance U.S. national security objectives towards Cuba. While some of these opportunities are fleeting, others are as inevitable as the “biological solutions” the island’s geriatric leadership. As a result of the later, the government will almost certainly have at least one more succession or transition in the coming decade. It is the purpose of this paper to provide a U.S.-Cuba background, proposed succession and transition scenarios, address some of those nascent prospects, discuss the resultant security policy implications, and finally make recommendations. Fidel Castro said Sunday claims he had suffered a massive stroke and was practically in a "neuro-vegetal state" were "voracious lies" and "outrageous nonsense." I like to write and I write, I like to study and study. There are many tasks in the area of knowledge. The sciences, for example, have advanced with such an astonishing speed. EFE is reporting that Fidel Castro surfaced at the Hotel Nacional in Havana. 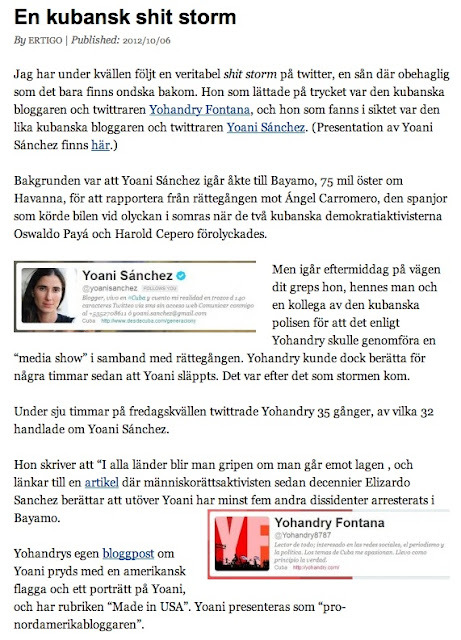 See story (in Spanish). The president of Cuba Fidel Castro met Saturday in Havana with Venezuelan former vice president Elias Jaua, who subsequently joined him at the National Hotel in Havana, which is his first public appearance since months ago and after weeks of rumors about his health. Jaua confirmed to reporters today this reappearance of Fidel Castro at the National Hotel, where he showed a photograph of the leader of the Cuban revolution in a vehicle, smiling and looking good. 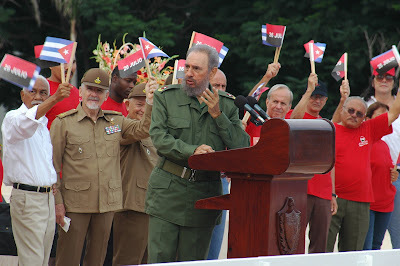 "Comandante Fidel kindly received us yesterday. 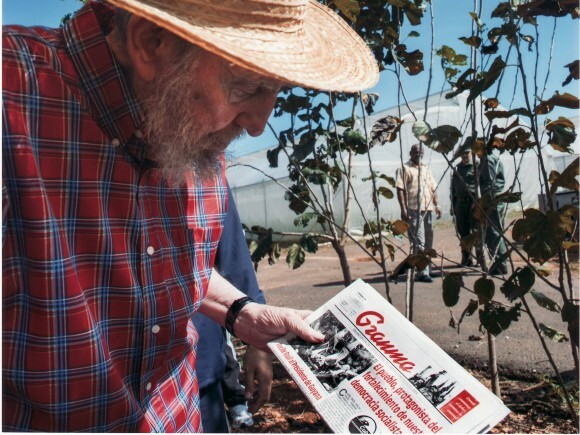 He stayed for five hours talking about agriculture, history, international politics and, well, Fidel is fine," said Jaua. One of Fidel Castro's last big speeches from Tracey Eaton on Vimeo. With Fidel Castro in the news again, I decided to post audio-only excerpts of one of his last major speeches before he fell ill in 2006. 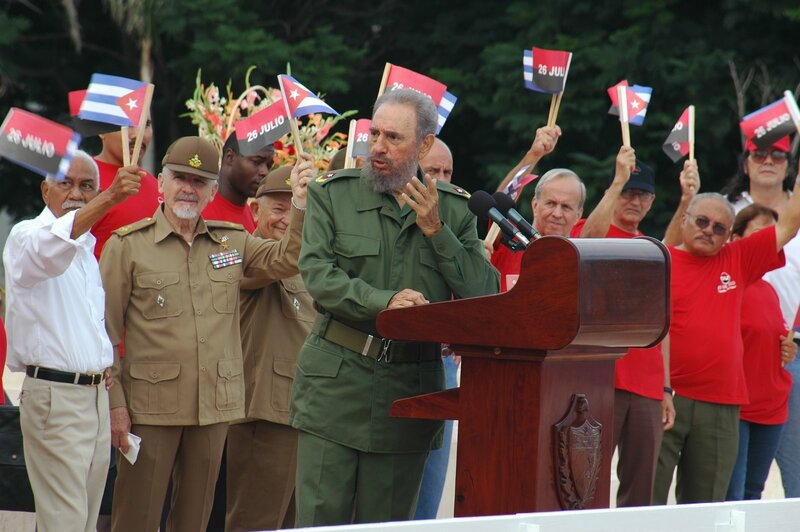 Castro made two speeches on July 26, 2006, the anniversary of the start of the revolution. The first - this one - was in Bayamo in eastern Cuba. It began just after dawn and lasted more than two hours. The second speech - in Holguin - was much shorter. Hours after the second speech, Castro underwent emergency surgery for an intestinal ailment. He dropped out of sight while recovering for four years after that and didn't give a speech again until September 2010. The government provided an official transcript of the Bayamo speech (download 18-page document). It doesn't match precisely what Castro said that day. Go to jump for photos. Below are excerpts from a background briefing on the 2013 State Department-USAID budget. This was described as a "special" briefing, not just any old ordinary briefing. This session is on background. We have State and AID officials, so since there’s a mix, let’s just call this Administration officials. (Inaudible). I’ll let the three of them introduce themselves very briefly, and then I’ll moderate the questions. So let’s go ahead. You want to start? SENIOR ADMINISTRATION OFFICIAL ONE: Sure. I’m [Senior Administration Official One]. I’m [position withheld]. SENIOR ADMINISTRATION OFFICIAL TWO: [Senior Administration Official Two], [position withheld]. SENIOR ADMINISTRATION OFFICIAL THREE: [Senior Administration Official Three], [position withheld]. The officials didn't mention Cuba by name, but talked about Economic Support Funds, which Cuba receives. The briefing (download six-page transcript) was enlightening because it showed that federal budget can be both peculiar and complex. 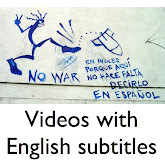 Me gustaría publicar este blog en inglés y español, pero yo no tengo tiempo para eso. Aun así, me gustaría empezar a publicar artículos y cartas ocasionales en español. Con eso en mente, estoy publicando la traducción de una carta que envié al Departamento de Estado el 15 de octubre (vea lo que escribí en ingles sobre el asunto aquí). 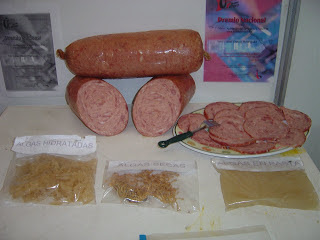 En la carta, pido al Departamento de Estado que no me cobre por una solicitud que hice bajo la Ley de Aceso a la Información. Normalmente, el gobierno cobra pagos nominales - o no cobra nada - a los periodistas que buscan información o documentos. Pero el Departamento de Estado niega la exención de pagos, diciendo que pertenezco a una categoría distinta de "periodista". Negar la exención de pagos puede ser un obstáculo para el acceso a la información. El gobierno puede cobrar no sólo el costo de la duplicación de documentos, sino también el costo de la búsqueda y el examen de los documentos. Los costos pueden llegar a los miles de dólares. Sospecho que el Departamento de Estado lo está utilizando como una táctica para mantener en secreto documentos relacionados con sus programas de promoción de la democracia en Cuba. My grandmother's sister, Marno Davidson, was home management editor of the Ladies' Home Journal. She was a remarkable woman who excelled in journalism at a time when men dominated the field. Marno had tremendous curiosity about everything, took notes constantly and traveled the world. She wrote wonderful letters and postcards that would arrive suddenly from exotic locations, never failing to brighten my day, although it sometimes took the entire family to decipher her handwriting. She was born in Iowa in 1907, worked her way to New York and got into magazines. While at the Journal, she lived in Upper Nyack, N.Y. I remember the walls of her home were covered with black-and-white photos showing her posing with Hollywood celebrities of the 1950s and '60s. Marno exercised before it was fashionable and insisted on jogging around the block even after Thanksgiving dinners. In the early 1970s, she organized a family reunion in Colorado. "Cousins' Capers," she called it. Tie-dyed shirts were waiting for the cousins when we arrived. 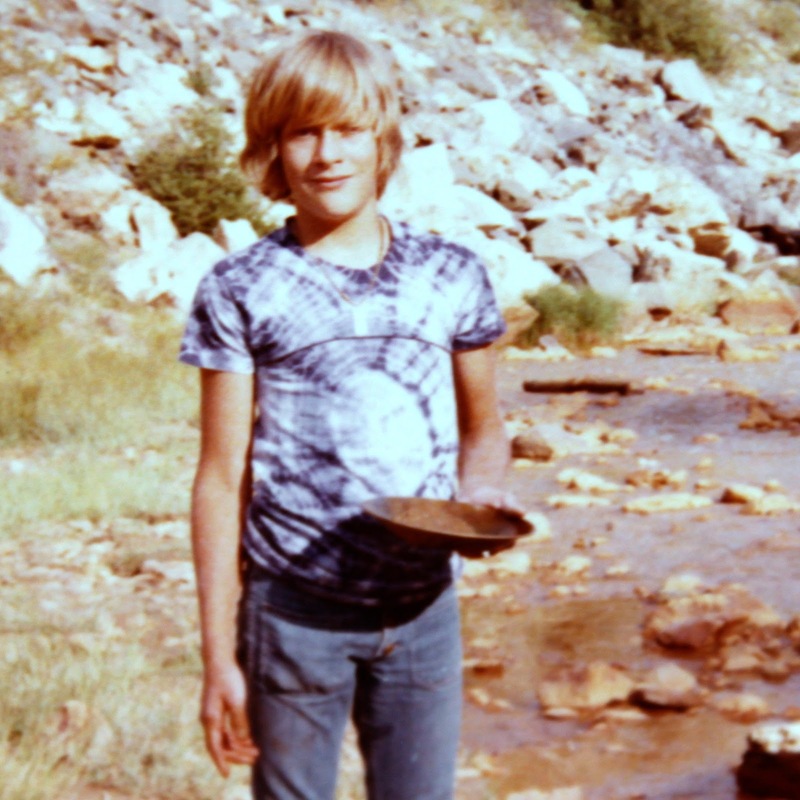 One cousin, Rob Eaton, is still a fan of tie-dyed clothing. 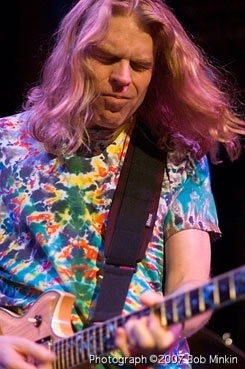 Fittingly, he became a guitarist and vocalist for Dark Star Orchestra, a popular Grateful Dead tribute band. While at the reunion, we went panning for gold and managed to find a few specks of yellow dust. Marno moved back to Iowa after retiring and died a decade ago in Ames. Politics aside, Marno's energy, curiosity and enthusiasm for life remind me of Cuban author Marta Rojas. Marta won fame for her coverage of Fidel Castro's trial after the assault on the Moncada military barracks on July 26, 1953. She has worked for Granma newspaper since it was founded in 1965. I met her in the 1990s and have stayed in touch with her over the years. Like Marno, she has led a fascinating life. She once told me the story of her family while the camera rolled (see below). A family history: Marta Rojas from Tracey Eaton on Vimeo. Fidel Castro has sent a message of congratulations to graduates of the Instituto de Ciencias Básicas y Preclínicas Victoria de Girón (Institute of Basic Medical Sciences and Girón Victory Pre-Clinics). 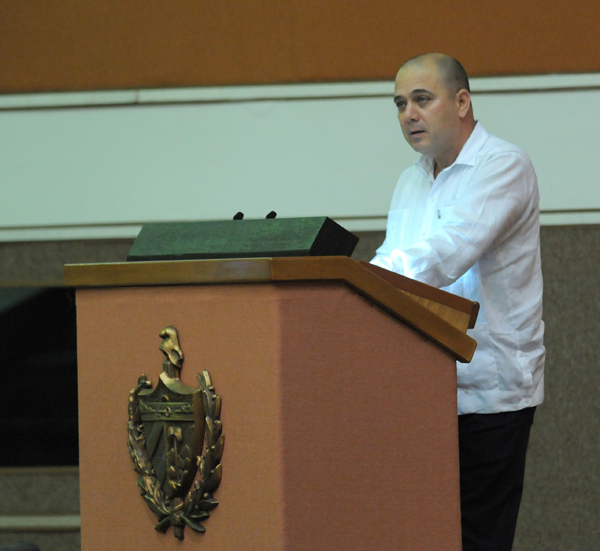 Roberto Morales, Minister of Public Health, told the graduates they had "fulfilled their duty with honor." The message said Castro recalled opening the institute 50 years ago "in response to the criminal action of the neighboring empire, which took most of 6,000 available to the country at the time with promises of employment." Prensa Latina reported the story, which followed recent rumors of Castro's demise. The former Cuban president hasn't been seen in public since March. Not everyone believes Castro is still alive. "He's dead and that's it," Miami radio commentator Nelson Rubio said on Facebook after seeing the latest report. On Oct. 18, ABC newspaper quoted Venezuelan doctor José Rafael Marquina as saying Castro had suffered a cerebral embolism - a stroke. None of this information has been confirmed. 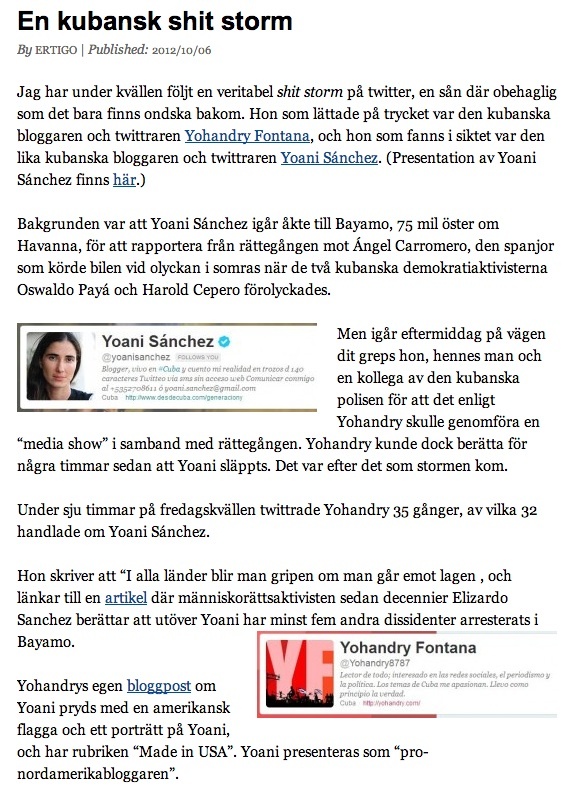 I don't read Swedish, but I like the headline in journalist Erik Jennische's blog. 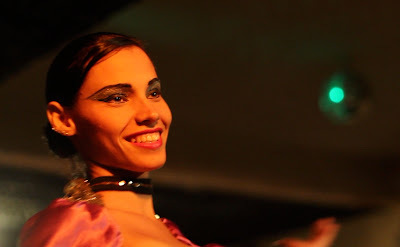 A dancer performs in Santiago de Cuba. 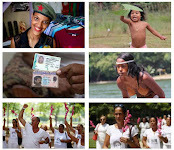 Download PDF of Cuba's new immigration rules (in Spanish). The U.S. government customarily grants fee waivers to journalists who seek documents under the Freedom of Information Act, or FOIA. Threatening to charge fees can effectively block independent journalists from obtaining documents that are in the public interest. It appears to me that the State Department uses such techniques to harass or stall journalists who seek information that the government wants to keep secret. In April 2011, the State Department classified me as "news media" for FOIA purposes. 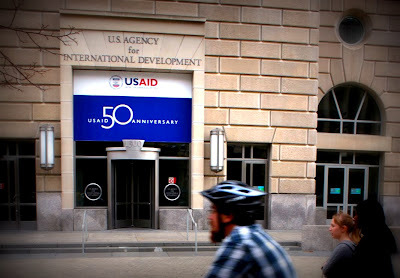 The U.S. Agency for International Development agreed in November 2011. But the State Department is now refusing the fee waiver (download State Department's Sept. 27 letter) and classifies me as "other," not a journalist. Uncle Sam's attitude might be different if I hammered away at Cuba's socialist government a little more often. The government's Radio Martí has paid journalists hundreds of thousands of dollars over the years. Here's a giant 813-page document listing Radio and TV Martí payments to journalists, consultants and others from 2003 to 2010. 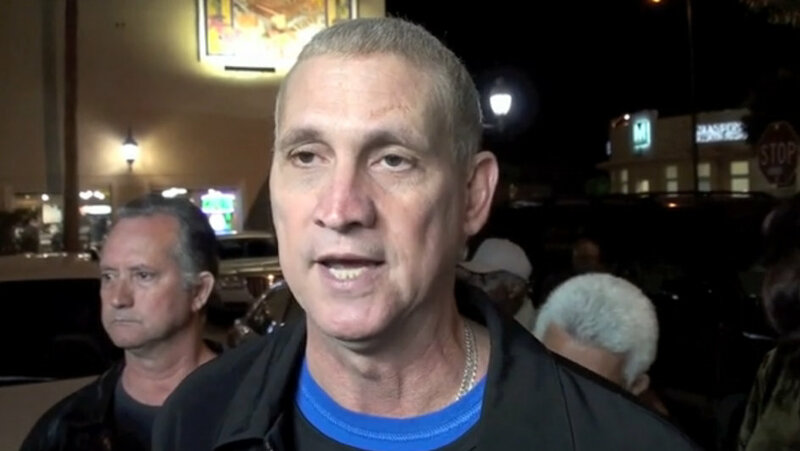 Some government-financed journalists have advocated armed attacks against Cuba, according to Reporters for Hire, a website that contends that five Cuban spies were wrongfully convicted in Florida in 2001. I personally think it’s an acceptable method. It’s a way of damaging the tourist economy. The message that you, one, tries to get across is that Cuba is not a healthy place for tourists. So, if Cuba is not a healthy place for tourists because there’s a few windows being blown out of hotels, that’s fine. 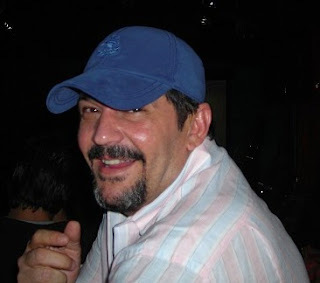 Was employed by the U.S. government while he was working as an “independent” news director on the powerful right-wing Spanish-language radio station in Miami.He received $5,200 to host a weekly Radio Martí show from Oct.1, 2000, to Sept. 30, 2001, for a total of $10,400. I could go on. What's certain is that the U.S. government does not treat journalists in an even-handed way. 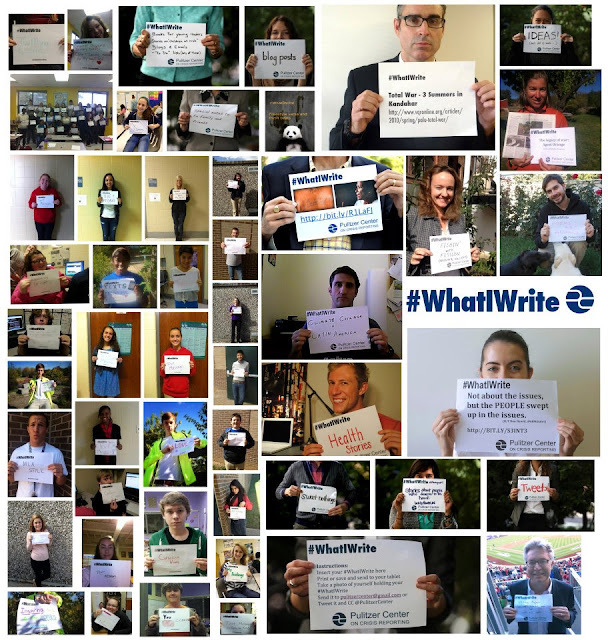 I am writing to appeal the State Department’s denial of a fee waiver in connection with Freedom of Information Act (FOIA) Request Case No. 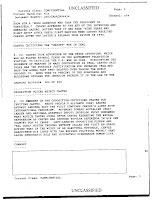 F-2011-25244, which seeks records pertaining to a democracy promotion program in Cuba. An iguana peers at the camera at San Pedro de la Roca castle, also known as El Morro de Santiago. The military fortress, built in 1638, is in eastern Cuba. Marion Albert Pruett, a.k.a. "Mad Dog"
I pulled in and was going to get gas and I seen that there was a girl working there by herself and I said well hell, I think I'll just rob her and kill her so that's what I done. Put it this way. If there were a gun on the table and you pissed me off, I'd blow your head off. Fidel Castro has died so many times I never know if the latest report is for real. In 2009, after Castro dropped out of sight for months, I published a piece on the Cuban leader's legacy. This time around, I am going to wait for facts to emerge about the fate of the 86-year-old former president. Anya Landau's piece is thoughtful from the start, with a headline reading, "When Thinkers Collide: USAID Offers Cuba Grant to NAF." 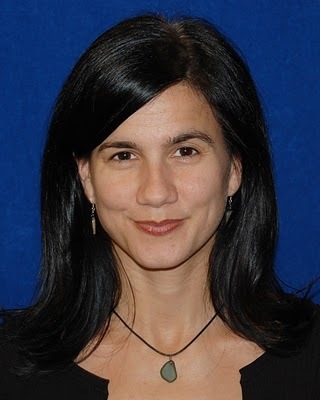 Landau explains that she is not involved in any USAID grants, but will offer her insight and advice as the New America Foundation moves forward with a grant from the U.S. Agency for International Development. This weekend, I was gearing up to blog about why a Chavez defeat in Venezuela may not have spelled complete and immediate disaster in Cuba. I was percolating up some pretty plausible arguments. But, with Chavez’s win, Cubans at least have been spared that conversation, for now. I might have been left without anything interesting at all to write about, were it not for the investigative reporting of veteran Cuba reporter and blogger, Tracey Eaton, who through his Cuba Money Project has done some of the finest grain investigating into USAID’s controversial Cuba programs that anyone has undertaken. 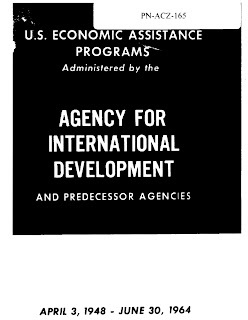 Tracey learned of a big new USAID grant to the New America Foundation, which as readers well know, is home to the US-Cuba Policy Initiative founded by Steve Clemons and led by yours truly. An unexpected visitor showed up on a Monday afternoon. A nice pal, to be sure, but I decided to send him outside where he'll be more happy. Here's a new press release about Ana Margarita Martinez, ex-wife of Juan Pablo Roque, the former spy now living in Havana. The story of Ana Margarita Martinez will be told mini-documentary style on the new series. 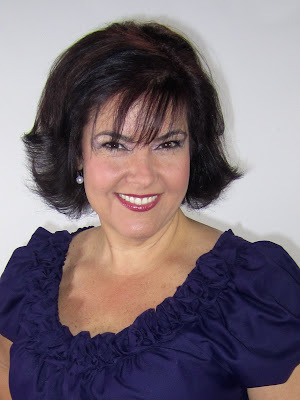 (Miami, FL - October 2012) - The story of Ana Margarita Martinez, a Miami woman who was married to Cuban spy Juan Pablo Roque, was chosen to launch a new series on the new Lifetime series “My Life is a Lifetime Movie”. The series will feature her story on its first episode Wednesday, October 17th at 10:00 p.m. The “My Husband was a Cuban Spy” segment will run that evening from 10:30 to 11:00 p.m. EST. 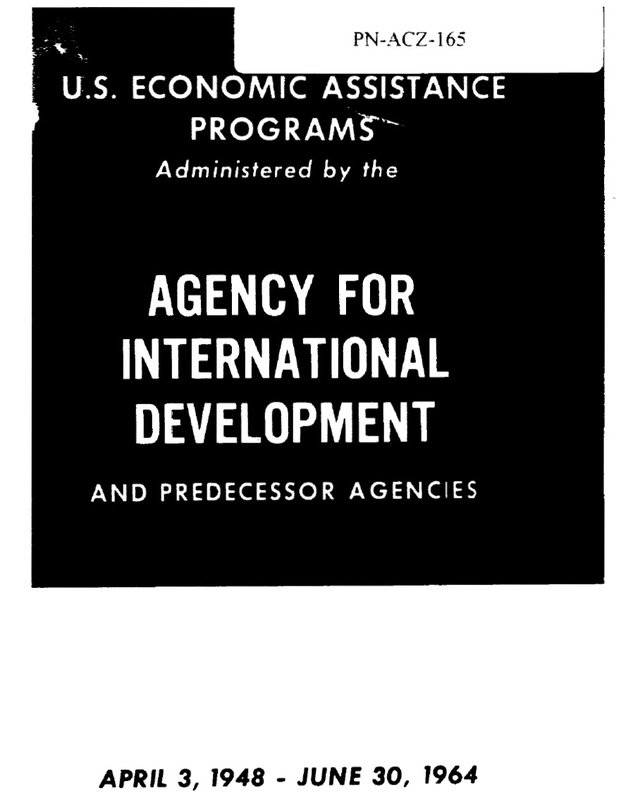 The U.S. Agency for International Development gave Cuba $2.8 million in economic and technical assistance from from April 3, 1948, to June 30, 1964, according to this 75-page document. Venezuelans go to the polls today to elect their next president. Many polls have Hugo Chavez in the lead, but challenger Henrique Capriles has a chance of upsetting him. Cuba will feel it if Chavez loses. Venezuela is Cuba's most important economic and political ally. Capriles would certainly cut back the multibillion-dollar subsidies that Venezuela sends Cuba every year. 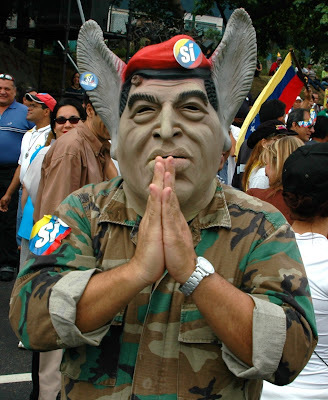 I shot these photos at a protest in Caracas during the failed Chavez recall attempt in 2004. The size of the crowds at opposition rallies seems to have grown since then. Here's a cool graph showing that Cuba is poor but healthy. Another comparison: Cuba vs. Florida. 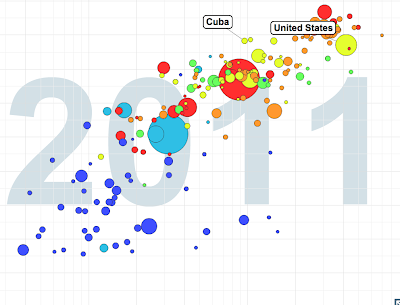 Open Internet Tools coming to Cuba? In August 2011, the State Department awarded the New America Foundation a two-year $1.4 million grant to manage a project called Open Internet Tools, USASpending.gov records show. OpenITP is a collection of open source projects that help build a truly unfettered internet -- private, anonymous and resistant to control. The projects enhance existing infrastructure, working to enable and protect communication, even in the face of active attempts to suppress it.Its goal is to enable people to talk directly to each other without being censored, surveilled or restricted. The New America Foundation just received a $4.3 million USAID grant for work in Cuba. 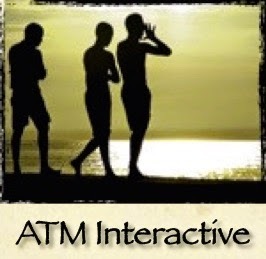 Perhaps the foundation plans to bring OpenITP projects to Cuba. 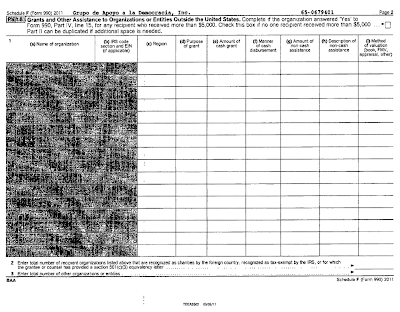 Grupo de Apoyo does not disclose recipients of its funds, a tax form shows. In September, the U.S. Agency for International Development awarded the Grupo de Apoyo a la Democracia $3 million for a three-year Cuba program. 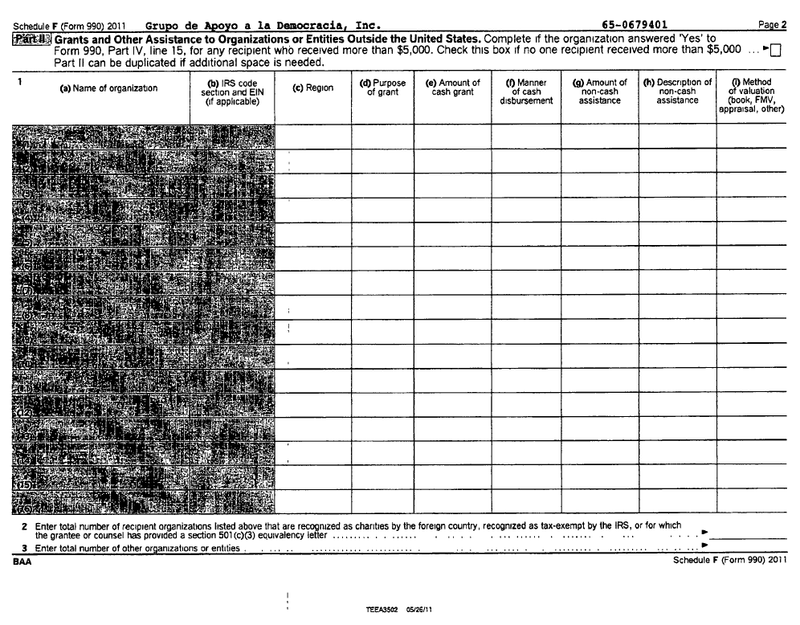 The non-profit organization sent 36,000 pounds of food and over-the-counter medical supplies to the families of political prisoners and civic activists, according to its 2011 IRS Form 990 (download 30-page document). The U.S. Agency for International Development has awarded the New America Foundation a $4.3 million grant to carry out a Cuba program over the next three years. One source told me that the money will go to the foundation's newest project, the Open Technology Institute. I haven't been able to confirm that with the institute. New America Foundation spokesperson Clara Hogan did not answer an email requesting comment. Interestingly, another foundation program, the U.S.-Cuba Policy Initiative, is aimed at engagement with Cuba, unlike most USAID programs which seek to undermine the socialist government. The U.S. Agency for International Development on Friday denied my appeal of its refusal to release information about a Freedom House program called "Alternative Methods to Increase Information and Assistance in Cuba." I filed my first appeal to a USAID FOIA denial more than a year ago - 423 days, to be exact. This is the first response I've gotten back to one of my appeals, listed here. In this case, I argued that USAID's use of an exemption protecting trade secrets and commercial or financial information was unwarranted and went "against the spirit of an open and honest government." The submitter, Freedom House, provided statements of how they took care to keep details of the activities of the Alternative Methods to Increase Information and Assistance in Cuba Program confidential for two reasons: (1) for the safety of the participants and (2) to protect proprietary knowledge. Freedom House considers the strategies they developed to be trade knowledge in promoting human rights and those strategies are highly specialized and proprietary in nature. To release such information would compromise the confidentiality of the program, its content, and participants. 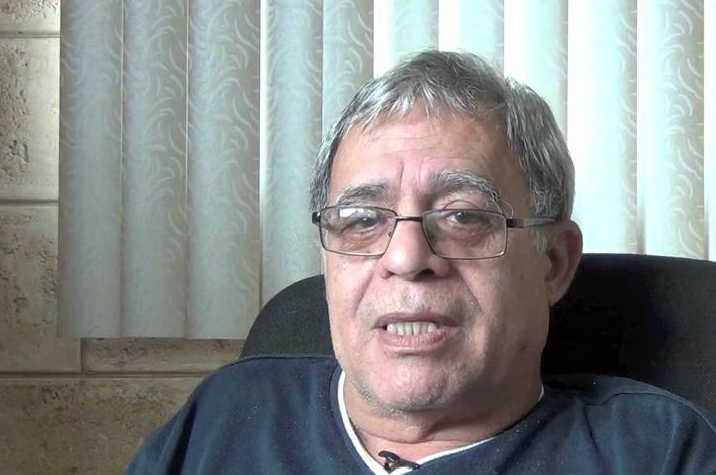 Cuban journalist Edmundo Garcia hosts a Miami-based radio show called "La noche se mueve." He called me today and asked if I secretly recorded any of my interview with former spy Juan Pablo Roque. Of course not, I said. The interview was on the record. Later Garcia said he contacted Roque, who confirmed my story and said I didn't try to deceive him. But the idea that I somehow tricked Roque is circulating, like feathers in the wind, thanks to a former state security agent named Percy Francisco Alvarado Godoy. Tracey Eaton may not have betrayed his interviewee, but he gave ammunition to biased Miami mobsters so they could fatten themselves with anti-Cuban perversion. Alvarado's chief complaint, according to a post entitled, "Alguna culpa tenía Tracey Eaton," seems to be that I passed the Roque interview to América TeVe, a Miami cable TV station that Alvarado sees as biased. That is true. That's what I did - and I can live with that. Juan Pablo Roque (part 4) from Tracey Eaton on Vimeo. 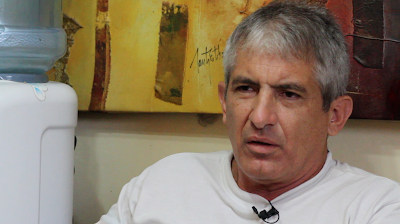 Oscar Haza of "A Mano Limpia" continued reporting Thursday on my interview with former Cuban spy Juan Pablo Roque. His guests: Roque's ex-wife Ana Margarita Martínez and José Basulto, head of Brothers to the Rescue, the exile group Roque infiltrated in South Florida before slipping back into Cuba in 1996. 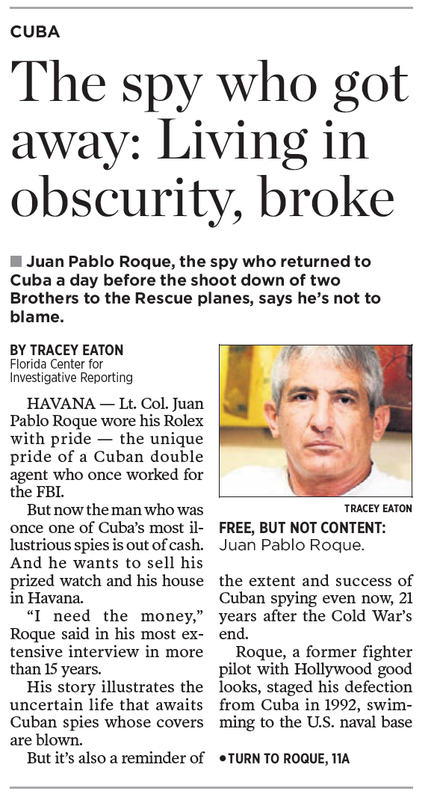 There has been a flurry of reaction to the interview I did with former Cuban spy Juan Pablo Roque. I haven't waded through all the comments circulating on the Internet, but I'd like to mention a point of fact. I didn't secretly record any of the conversation, claim the audio recorder was off or try to deceive Roque. Yet Percy Francisco Alvarado Godoy, a former state security agent now working as a journalist and blogger, said today I led Roque to believe that the recorder was off, violating a supposed agreement with Roque. 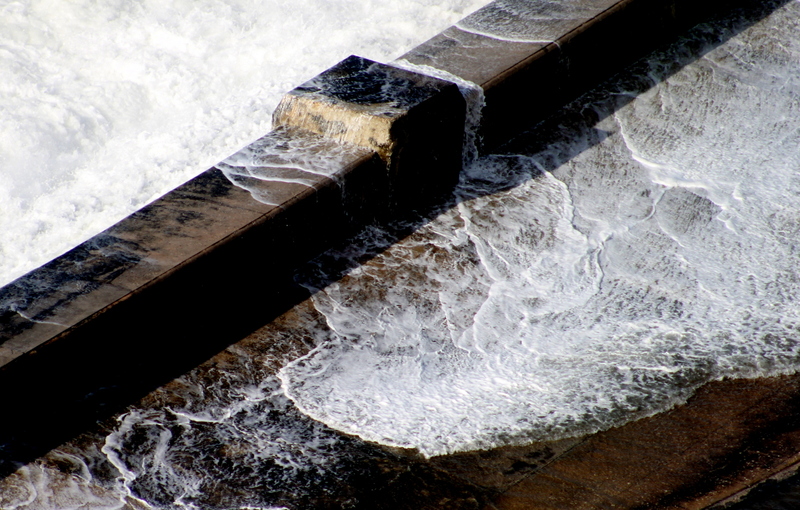 Juan Pablo Roque (part 3) from Tracey Eaton on Vimeo. 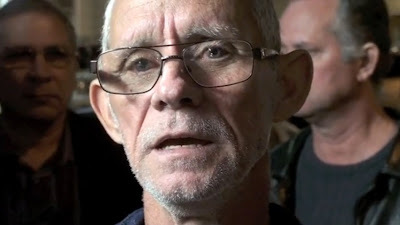 Dominican-born journalist Oscar Haza of América TeVe interviews three relatives of victims of the Cuban military's 1996 shoot-down of two civilian aircraft in the Florida Straits. He asks them to react to my recent interview with former Cuban spy Juan Pablo Roque. See part 1 and part 2. 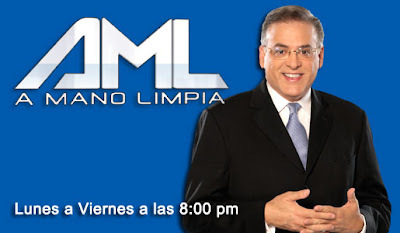 Kudos to Oscar Haza, host of "A Mano Limpia," for broadcasting my interview with former Cuban spy Juan Pablo Roque. Haza, along with América TeVe news director Miguel Cossio, recognized that the Roque story has news value and is broadcasting it exclusively this week. I wrote a main story and sidebar about the interview for the Florida Center for Investigative Reporting, which distributed the pieces to other publications. The story is creating a buzz in Miami, where the Miami Herald and El Nuevo Herald versions of the piece had generated more than 1,165 comments by Oct. 4. Many news websites and blogs picked up the story, including Telemundo, CubaEncuentro and Diario de Cuba. Juan Pablo Roque (part 2) from Tracey Eaton on Vimeo. See part 1 and part 2. Or go to América TeVe website. Spy's ex-wife reacts to "made-for-TV interview"